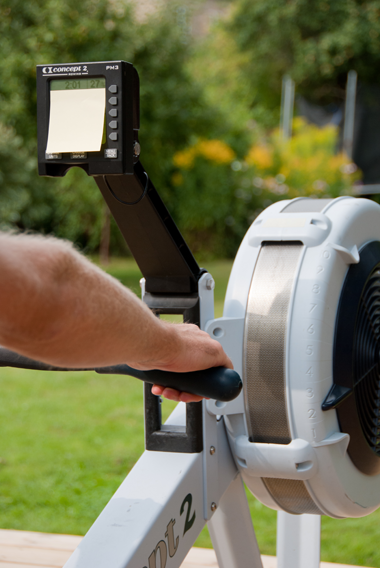 The purpose of measuring your power efficiency is to find your standard stroke, and how you are able to keep your standard stroke while changing the rate you row in. When you are performing the power efficiency test, your rhythm and flow must feel just like when you are performing the workout 5+5+5 min in 22-24-26 spm in a boat and feeling the good rhythm and good flow. You need to have the instructions and something to record your results with you to the erg eg. smartphone or print this page, bring the page and a pen to your erg. Perform this test alone; do not perform the test with any other person who might press you to push more, it is not the purpose of this test. Warm-up and wait about five minutes before starting the test itself. Set up the monitor to count down from six minutes and save the split times for each minute. Cover the part of the Concept 2 erg monitor showing the current split and distance. Perform the test by rowing 1+1+1+1+1+1 min in 20-20-22-24-26-28 spm. NB!, you need to row 20 spm twice. When ready, complete the test. After the test, read the split times for each minute, measured in watts, and note them down.